An unusually large amount of plastic rubbish appears to have washed up on Milnerton’s Sunset beach, say residents, and fingers have been pointed at ships moored in Table Bay during the recent three-week Transnet strike. Milnerton resident Glenda Neville, who said she had walked her dogs on Sunset Beach for the past 12 years, said she had never seen anything like it. Neville said she walked along the beach on Sunday and there were “volumes” of plastic litter covering the beach for a distance of about three kilometers. “Because of the volume of rubbish I surmise that it’s because of people on the boats dumping refuse into the water during the strike,” said Neville. She said she had reported the matter to the Green Scorpions. Sunset Beach Home Owners Association (SBHOA) chairperson Charles Marx said they were “very concerned about pollution on the beaches”. He said the pollution gave the lie to English sea Captain Sir Francis Drake’s oft-repeated quote that this was the ‘fairest Cape’. Allow pollution on the Table Bay shoreline demonstrated a lack of “mental application”, he said. “All players that have a role in this problem need to get over themselves and get on with putting right what has been permitted to go wrong,” he said, and challenged the port, food retailers and businesses involved in plastic packaging to the join the SBHOA’s bi-annual beach cleaning outing. Transnet National Ports Authority Cape Town Corporate Communications Manager Coen Birkenstock denied that rubbish covering the beach came from the harbour. “We manage the economic function of the port, ships in the deep sea fall outside of our jurisdiction.” Birkenstock said the pollution could originate from a number of sources, such as storm water outlets or passing ships, but it did not originate from the port. 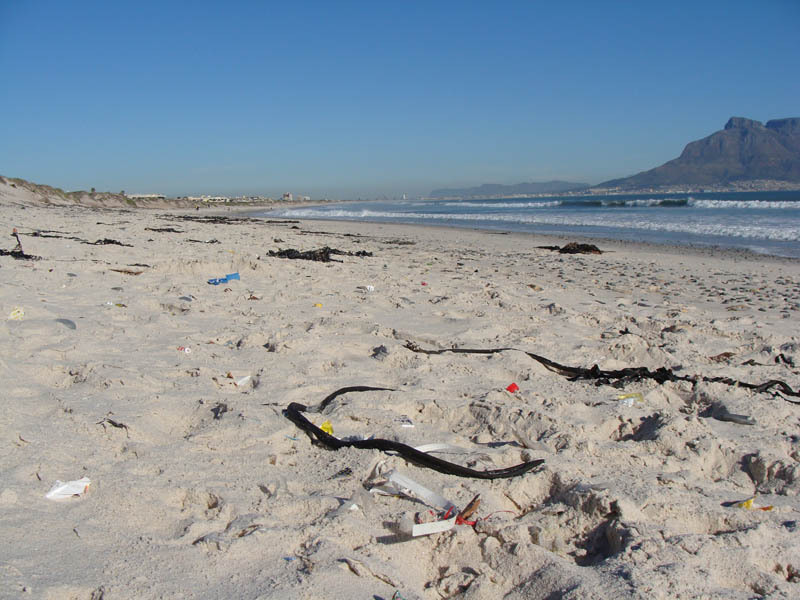 Asked whether the large volumes of litter may have come from ships in Table Bay, Provincial Department of Environmental Affairs marketing manager Aziel Gangerdine said a site investigation would have to take place before that could be established. Gangerdine said pollution on Sunset beach warranted a response from the local municipality, but if they failed to address the problem, the province could intervene in accordance with environmental legislation. City’s roads and stormwater director Henry du Plessis said the city was not aware of the pollution, but would investigate. — West Cape News.